On the 22nd day of March 2014, Sheriff Keith Slape reports that a Sheriff's Deputy went to the Joseph Dale Robinson residence in search of another person his Office was looking for. Deputies recognized Robinson at the property and knew him to have a warrant for Hot Checks. Robinson was arrested for the warrant and Deputies found suspected methamphetamine on him. 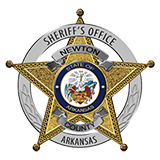 The following day, a search warrant was executed at the Robinson residence where Deputies located more suspected methamphetamines as well as methamphetamine paraphernalia and numerous firearms. Joseph Dale Robinson, 34 of Western Grove was charged with Simultaneous Possession of Drugs and Firearms and Ryan Lewis, 22 of Jasper was arrested and charged with Possession of Methamphetamines. Both individuals have since posted bond and have been released from jail.